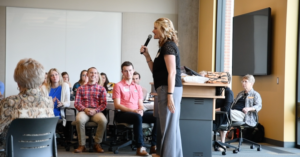 Sunshine filled the Weldon Webb classroom as 67 accelerated nursing students filed in with backpacks on and coffees in hand. 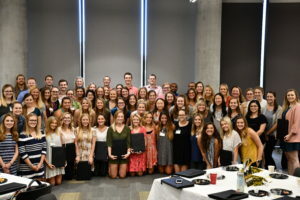 The Nursing Alumni Organization at the University of Missouri hosted the annual Accelerated Student Welcome Continental Breakfast on Friday, June 15. Students mingled with School of Nursing faculty and leaders from Boone Hospital and MU Health Care. After breakfast, several leaders in nursing took turns speaking to the students and encouraging them in their studies. Mary Beck, joint courtesy faculty and chief nursing officer, MU Health Care, was among those in nursing leadership in attendance. 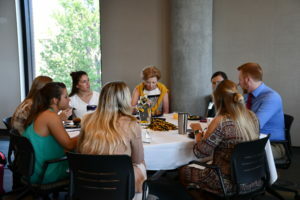 Mary Beck, joint courtesy faculty and chief nursing officer, MU Health Care, center, enjoys breakfast with current accelerated nursing school students. Associate dean for Academic Affairs, Robin Harris, also addressed the group and reminded the students that they can reach their goals. “Know that we wouldn’t have said yes to your name if we didn’t think that you could do this,” Harris said. Robin Harris, associate dean for academic affairs, reminded the students to “embrace every moment of this really fast paced program”. Current accelerated class for 2018-2019. Sixty seven students have begun course work in the rigorous 15-month program. Susan Devaney, Nursing Alumni Organization president, handed each student a black leather padfolio as a welcoming gift. The students then gathered for a group photo before heading back to class. Go to our Facebook page to see more photos from the morning.